I just wrapped up the first round of revisions for my newest book, The Raven's Tale—my novel about Edgar Allan Poe's teen years—which Amulet Books/Abrams will publish in Spring 2019. This was the editorial letter stage of the process, in which my editor, Maggie Lehrman, sent me her comments and suggestions for the book, and I revised the novel accordingly. I spent over 2 1/2 months gutting and rewriting about 70% of the manuscript—an intense yet, ultimately, exciting process—and I'm ecstatic to now have a little break. 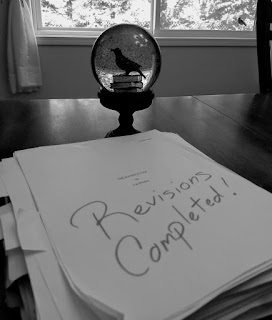 Next up will be line edits, which will involve Maggie going through the entire manuscript and marking suggestions ranging from grammar fixes to additional story changes. Because the plot of the book might still get affected by future revisions, I'll only share a few more details about the novel at this point. The Raven's Tale opens shortly after Edgar Allan Poe's 17th birthday in January 1826 and ends in May 1827 when he's 18. Poe himself is a point-of-view character, which has been a challenging but ridiculously fun and entertaining viewpoint to write. I'm calling this book my "literary rock opera." As I've hinted before in an Instagram post, there are certain scenes in the novel that unfold like musical numbers. I haven't yet seen any signs of early cover plans for the book, but if the novel stays on track for a Spring 2019 publication, I'll probably get to look at a design this summer, and, of course, I'll share the finished cover as soon as I can! Pre-order links aren't yet available, but you can go ahead and add The Raven's Tale to your Goodreads shelves. 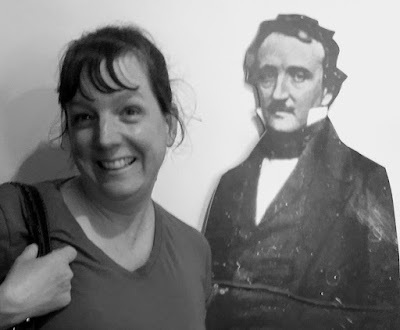 Me and "Eddy" at The Poe Museum in Richmond, VA.